Our engineers have developed an efficient heating solution for every building, every climate and every budget. The European heating industry is ready to bring the digital revolution to European buildings. Smart heating will make it happen. 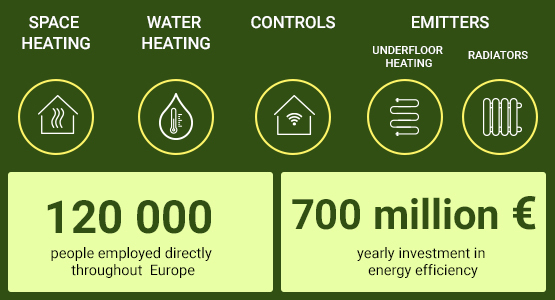 The European heating industry brings together companies that are leaders in the production of efficient heating systems. Our engineers develop the heating solution for every need, from boilers to solar thermal systems, from heat pumps to fuel cells, from radiators to underfloor heating. Whether you are in a cottage in Sweden, a skyscraper in Frankfurt or a guesthouse in Sicily, we make it work. But the energy landscape is changing. For tomorrow, our members are innovating in hybrid and digital solutions. They are developing high-efficiency and renewable systems. These innovations will improve your home and Europe’s environment. Just like we make your heating system work, we make Europe’s energy transition work.